The elevation of Tepoztlán is midway between that of Mexico City and Cuernavaca, at 5627 ft. It is 19 degrees north of the equator. These are some of the factors that make its climate a very favorable temperate one. I’ve lived here as an expat for fifteen years. It's a designated “Pueblo Magico” in the central Mexican highlands. Formerly a volcanic region, the town of a population of 50,000, is an hour drive south of Mexico City (elevation 7350 ft.), and half an hour east of Cuernavaca (4954 ft.). 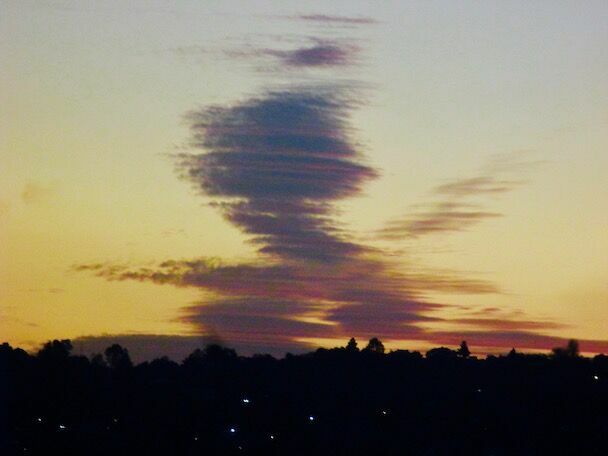 Whimsical "angel" cloud at sunset in Tepoztlán, Mexico. Photo by Don Karp. The active volcano, Popocatépetl is 25 miles away, and during active times, a layer of ash is deposited. Undoubtedly this leads to some of the spectacular sunsets that you can see in the slideshow below. The whimsical sunset angel in the photo above is one good example. There are two seasons in Tepoztlán: rainy and dry. Most of the year (December through May) it’s dry and sunny, with temperatures ranging from 50 ºF at night to a high of 85º in the day. The rainy season gets started in June, tapering in from a rainstorm once a week, to raining every day, beginning in August. When this happens, it’s usually an electrical storm that builds during the day, letting loose late afternoon or in the night. It’s very pleasant to have the air cleaned by the storm with sun the next day, and to observe the lushness of the verdant vegetation during this season. The rains taper off as the season ends, in November. More recently, the rainy seasons have shifted to later starting and ending times. The “canicula” (Dog Days, from Canis, the word Latin for dog) are a period of two weeks of dryness in mid-August. Temperatures drop in the winter months, to 45 ºF at night and up to 75º during the day. It’s a good idea to have a sweater or jacket handy. In the higher regions, where the highway runs, there have been frosts at night occasionally. A weather phenomenon I enjoy as the rainy season gets underway are the magnificent cloud covers. Notice from the slide show below, how similar these landscapes look to Japanese portraits. The clouds drape over the mountains like a scarf or skirt. 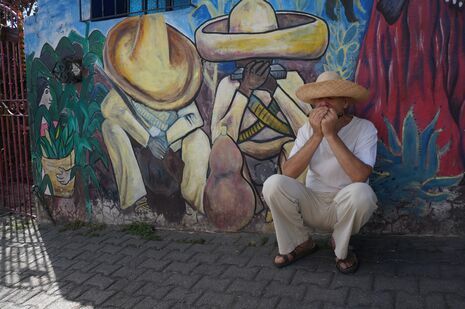 I doubt that many other places in the world have as even a climate as Tepoztlán. How does the climate where you are compare? Please share with us in the comments.